Superior Home Exteriors is a family owned and operated company that specializes in complete gutter solutions. We have been proudly serving homes across West Central Minnesota since 1995. Our team is truly committed to providing only the very best products and services to our customers and community. We treat each house as if it were our own and strive to deliver 100% satisfaction in every project, big or small. As our company grows, we will continue to be guided by this philosophy and to bring you new and innovative products that will make your life easier, safer and better. Our product and service offerings include standard 5” and 6” rain gutters, our exclusive TKS Designer Gutters, gutter repair and Gutter Helmet®. 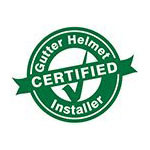 Superior Home Exteriors is proud to be an authorized dealer for Gutter Helmet®, America’s number one choice in gutter protection for over 30 years. Our patented gutter covers have a unique nose-forward design that uses surface tension and gravity to effectively keep leaves, twigs and other debris out of your gutters without getting in the way of the flow of water. The Gutter Helmet® promise is that you’ll Never Clean Your Gutters Again®—guaranteed! That’s why we, along with millions of homeowners across the US, choose Gutter Helmet®. We hope you will, too. For more information on our gutter services or to get a free quote, call Superior Home Exteriors at (800) 824-3772. You can also use our online contact form to schedule a free in-home consultation with one of our friendly sales representatives.